Beside eating at the feeder, the junco also seems to like eating these old aster flower heads. 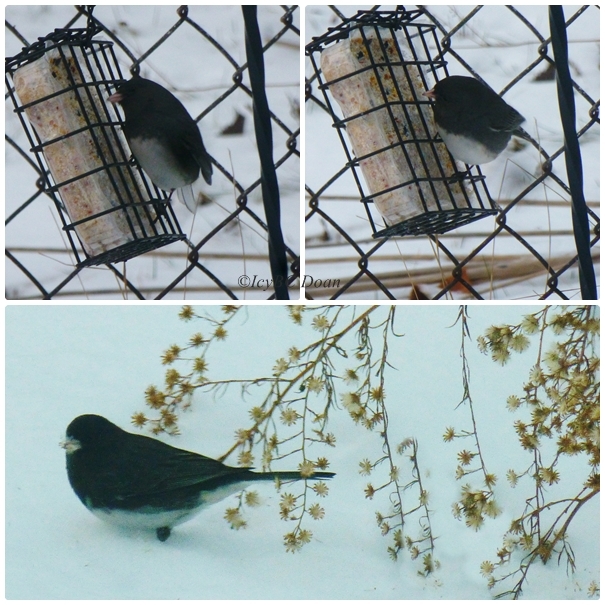 We had another two inches of snow during last week, but whenever the sun came out, the juncos came to visit too. I love seeing the cute Juncos! They are regulars here in the winter months. Cute mosaic. Have a happy day! Juncos are such sweet birds. I always look forward to their winter visits. The juncos are so cute. Juncoes came early here this past fall. They enjoy the seeds that spill from the feeder but rarely try to perch on it here. Good to see they are finding lots to eat amongst all that snow. Nice little bird - I recall being confused by them in a car park once on a trip in the USA! Feel free to link this post to Wild Bird Wednesday, which runs on wednesdays (!) on my photo-blog. I don't get to see juncos here, you got lovely captures. Wishing we had juncos in our yard to feed...your photos are great. We don't see them often here, but they sure are cute!